By Bianca Moragne It’s just another grade-school portable with four windows and a thick metal door, the kind meant to keep the shrill laughter of learning children inside and secure. Other than a sign on the door reading “HOSTS Learning,” nothing seems out of the ordinary. But behind the broad metal door on Portable 3 at Metz Elementary School in East Austin is an unconventional pathway to success. Housed inside on school days, eager children work to increase their reading levels, comprehension and vocabulary skills with support from University of Texas students under the HOSTS ‘Help One Student To Succeed’ Learning Program. Each tutoring session lasts 30 minutes and children scuttle through the portable during the day to learn in half hour sections with adult volunteers. Mentors are required to tutor one 30-minute session at the same time each week. 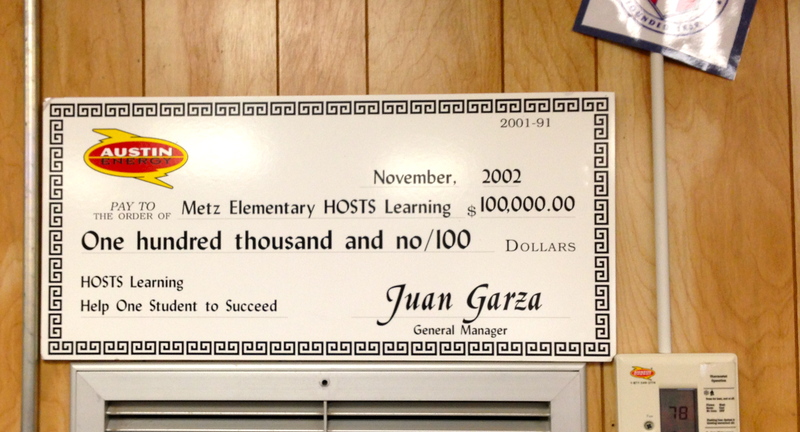 HOSTS began at Metz Elementary 12 years ago through funding from Austin Energy. Now, the program operates through a yearly award of $100,000 from the City of Austin. The money pays for Perez’s salary, her TA’s and administration supplies. Perez considered a regular teacher as determined by the AISD teacher salary schedule and paid accordingly. According to the City of Austin’s Mentor and Tutoring Program, HOSTS Learning began as a national corporation, recognized by the United States Department of Education as a model for successful language arts improvement. Since its inception in 1971, HOSTS has expanded its operation into hundreds of elementary schools nationwide. One effervescent HOSTS student, 7-year-old Eloy Garza, enjoys the one-on-one time with his mentor each week. Garza once struggled with reading, but now has grown fond of it. “I got helped with my tutors. I feel excited and happy to see them everyday because they can help me with my work and reading,” Garza says. “Now, I love reading.” Garza’s tutoring session is divided into 10-minute increments. First, he works on reading and comprehension skills, followed by vocabulary. The last 10 minutes are filled with a skilled activity. The Metz, children increase their reading level one to three grades in the HOSTS program. When the number of session hours per week is averaged it equates to 1 1/2 of the Metz student population being touched, Perez says. Hispanic population, there are often twice as many students with needs than bilingual mentors, she points out.